Except that the real prices have already fallen significantly (~37%) since the end of your plot. That aside, I agree that valuations are on the rich side for real estate, bonds, and stocks. Curious to where you suggest to place your savings? As long as inventory is low in the desirable areas around Boston, it follows that prices will continue to be high, perpetuating bidding wars spreading out to places like Malden and Medford. How long after this reported bubble pops does it take for it to become more of a buyer's market? I guess this is everyone's question. Using Boston during last bubble as the example. Bubble reported popped late 2008. It was not hitting rock bottom until beginning of 2011, right before the QE2 hits in. There was a bull trap period in 2009, while the tax break and QE1 kicked in. I guess in general it does take couple of years after bubble pop, before sellers finally giving in and start the fire sales. Different areas would have different period and level of price drop resistance as well. General rule of thumb is, it is a buyer market when even yourself don't want to buy. Curious, what makes Malden, Medford so hot these days? Is it simply the last affordable area close to Boston which are not infested by gangs and crime? Or is it a classic bubble, price is going up simply for no reason than to go up. I read it's due to the popularity of new Chinese restaurants, i.e. An viable alternative to Boston Chinatown which is attracting legal immigrants who have scrimped and saved and the prices are within their low range. Or possibly investors are buying to rent out rooms to overseas Chinese students? I would argue that 2009-2017 us the ultimate bull trap - multi -generation low for interest rates/mortgage rates. Lets be realistic here. Lets say the bubble pops in 5 years from now. 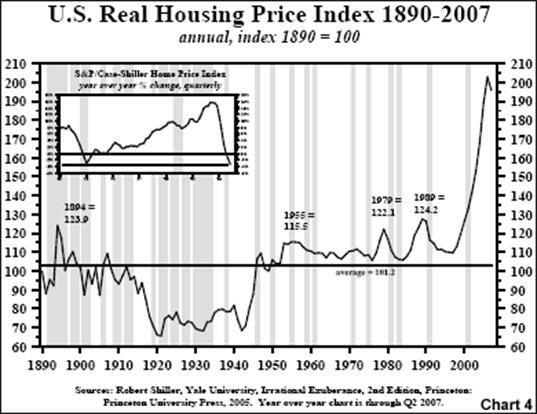 This is not unrealistic as it took 2 years after the stock market crash to see noticeable decrease in house prices. Since time is short, thats 13 years the owner has gotten to 'settle' down and put renting behind them. It allows their kids to settle into schools and neighborhoods. Of course, they could do this too if renting but "psychologically" IT IS different. You guys haven't seen a real housing bubble yet. All the previous bubbles were just head fakes. Just wait until the next recession hits and we see negative rates. Then you will see the mother of all housing bubbles. Sounds like you are describing the housing bubble of Japan in the 90's. Just the land surrounding the Palace in Japan was worth more than the entire state of California! The prices did eventually drop 50-70% from peak and haven't recovered since.. they've had negative rates for like 30 years now. Anything near the Orange Line is probably considered hot. Cambridge, Somerville and Arlington prices have gone through the roof so it makes sense that sections of Medford and Malden are the next hot spots. Also, easy access to 93 for some locations. Does anyone think that Trump's mass deportations will cause the housing bubble to pop? It makes sense that when 200k illegal immigrant renters are gone from the greater Boston area, rents should come down and bring down housing prices, too. mass deportations will cause the housing bubble to pop? It makes sense that when 200k illegal immigrant renters are gone from the greater Boston area, rents should come down and bring down housing prices, too. I had assumed that the number of illegal immigrants in the area was much lower, but I could be wrong. I'm concerned about the impact of his war on H-1Bs. Also his trade war against China. Also his trade war against Mexico. Also his high volatility in general. Also President Bannon's goal of burning down the whole economy. I believe trump is only focusing on illegal immigrants who have committed crimes (beyond being here illegally) such as DUI, theft, felonies, assault etc. Clearly that is not the 'majority' of illegal immigrants, although his policies may affect the 'increase' of illegals coming in the future. Absolute nonsense. Please tell me how we're in a generational bubble when left and right there are discoveries like CRISPR that are driving the biotech revolution, right here in Kendall Square. When the leading tissue engineers, a field that's still in its infancy, are in Cambridge. Tech and biotech will continue their explosive growth because there's a ton of money in it and human beings have an insatiable appetite for money, discovery, and glory. That's for existing immigrants, and it's potentially only the first step against existing illegal/undocumented immigrants (but we'll see). What I think is more consequential economically is that he also wants to significantly reduce future immigration. One part of that is ending H-1B visas, which the tech industry relies on, rightly or wrongly.